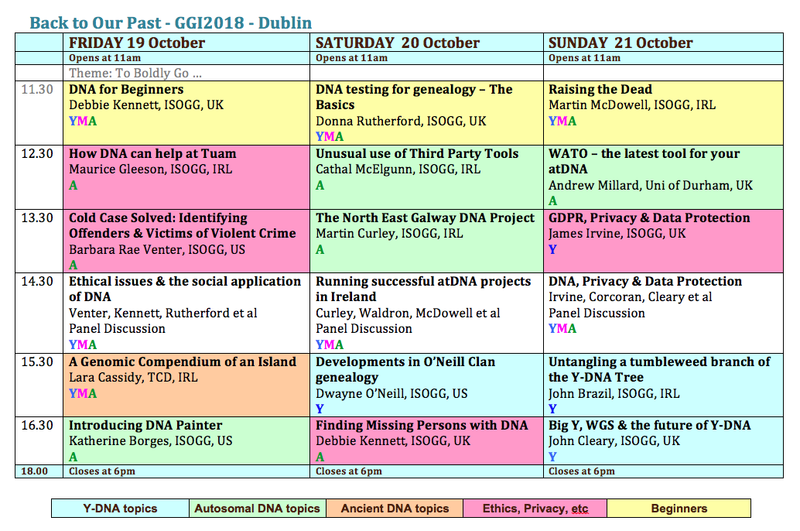 Genetic Genealogy Ireland returns to the RDS in Ballsbridge, Dublin from 19th to 21st October 2018. Admission is free by simply registering at www.backtoourpast.ie. Once again the lectures are kindly sponsored by FamilyTreeDNA and organised by volunteers from ISOGG. And this year a whole new stream of lectures is being added to the lineup - privacy, data protection & ethics. This is a timely addition to the programme. The past year has seen the introduction of GDPR (General Data Protection Regulation - the new EU law introduced on May 25th) and as a result there have been sweeping changes to privacy and data protection which have had a huge impact on the way all companies operate. It has also had some pretty devastating effects on the genetic genealogy community with the loss of the WorldFamilies.net website (and all the Surname Projects hosted there), the closure of genetic databases (Ysearch, mitoSearch) and the barring of EU residents from accessing products of companies such as Full Genomes Corporation and scientific journals (e.g. SurnameDNA journal). Click on the links and see if you can access them! There have also been extensive improvements to the FamilyTreeDNA website and the way that Project Managers can manage their DNA Projects. All of the above changes have been associated with knee-jerk reactions, teething problems, uncertainty, and much discussion over the best way forward for the genetic genealogy community and the institutions and organisations which serve it. Then in April we were alerted to the good news that "Buckskin Girl" (a murder victim who had remained unidentified for 37 years) had finally had her identity restored and her family could now find peace. The shocking part of the story was that the identification had been made by the use of Gedmatch - a public DNA database set up by members of the genetic genealogy community. On the one hand the news was not that surprising - for years we have been using the same technique (i.e. DNA & Genealogy combined) to help adoptees and foundlings trace their birth families. So in many ways this was simply an extension of the technique to a new area - identifying murder victims and solving cases of "missing persons". But it did create a hot debate on the use of our DNA by law enforcement agencies and it raised many questions including: what safeguards are needed to protect the public from the misuse, misapplication or misinterpretation of the DNA results by law enforcement agencies? These questions became even more pertinent when the police announced they had used similar techniques to identify a prime suspect in the Golden State Killer case. The field of genetics is advancing at an incredible rate. This applies to genetic genealogy and ancient DNA in particular. But it won't be long before there are similar major steps forward in forensic genetics and medical genetics. There is (and always will be) a need for public discussion on the issues raised by these new developments as they occur and this is reflected in the programme for GGI2018. Talks dealing with these topics include the presentation by James Irvine on GDPR and what it means for us, Debbie Kennett's talk on finding missing persons, Barbara Rae Venter's talk on how DNA can be used for the Greater Good, and my own talk on DNA testing options at the former Mother & Babies Home in Tuam (where the bodies of 800 children may be buried in a disused pit). These talks will address some of the hot topics that are being discussed not just within our own community but by the larger general public. There are also associated Panel Discussions to discuss both ethics and data protection which will allow the general public at the event to address any questions they may have. Martin will reveal the many successes associated with DNA testing of a local population (in this case, Galway). This latter presentation will be followed by a Panel Discussion on Autosomal DNA Projects, with hints & tips of how to run such a project should you want to set one up yourself. As well as these new speakers and new topics, we have a regular stream of Beginners talks (courtesy of Martin McDowell, Linda Magellan & Donna Rutherford), a stream of Y-DNA talks (Dwayne O'Neill, John Brazil & John Cleary), and a stream of autosomal DNA talks (Katherine Borges, Andrew Millard, Cathal McElgunn & Martin Curley). Several of the talks deal with third party tools. Katherine Borges will discuss the use of DNA Painter - the user-friendly tool developed by Johnny Perl that helps us manage our atDNA matches. And Andrew Millard will discuss WATO - another helpful tool co-developed with Johnny Perl & Leah LaPerle Larkin. To Boldly Go ... (where no one has gone before). The ratio of the sibling prevalence rate to the population prevalence rate (s/q) approached 1/ using the Penrose calculation, and the heritability degrees of vitiligo in the first- and second-degree relatives were 59.6% and 55.2%, respectively.